Is it a Judy? A Lisa? Or, a ghost? It's 1968 in Chelsea and Judy Garland is on the brink of her comeback tour, The Talk of the Town. 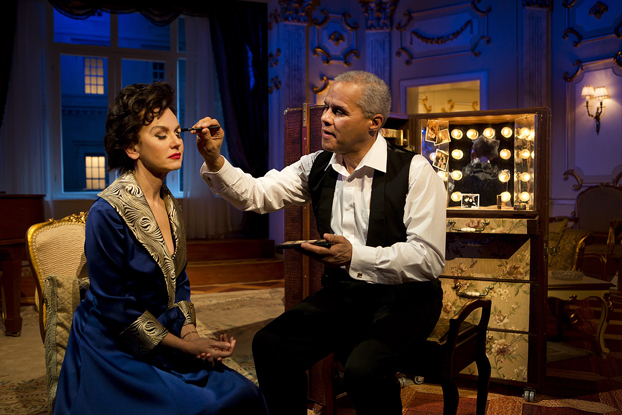 End of the Rainbow stars Gary Wilmot as devoted pianist, Anthony Chapman; Sam Attwater as Garland's then fiancé, nightclub owner, Mickey Deans; and Lisa Maxwell as Judy Garland. By the time we meet Judy in End of the Rainbow, she is 46 and has been battling with drug and alcohol addiction for most of her adult life. I say most, because she did try and quit both, however brief the alleged 20 minutes to a night is. It's no surprise then that Judy Garland circa 1968 was a heady cocktail of vivacious charm, nerves, self doubt and just a pinch of vulgarity. Wouldn't you be if you had been taking amphetamines when you hit double figures? Let's not forget the barbiturates to counteract the effect of the amphetamines so that the child star could sleep. All of this while standing in the spotlight, constantly thought of as heavy, and the ugly duckling next to other actresses such as Ava Gardner and Elizabeth Taylor. What a whacky world Hollywood was, and is. From the childhood of the inimitable Ms. Garland, or Baby Frances Gumm, we move to a slightly less story worthy childhood - mine. Before I hit double figures, I must have forced my two older sisters to watch and reenact the Wizard of Oz at least 20 times. I'm flat out lying to you right now, it was probably closer to 100 times... OK, 150... maybe 200. I don't know, I lost count. Accuracy aside, you get the picture. I liked that film — a lot. While one of my sisters claimed the Tin Man (if he only had a heart), Glinda the Good (Witch of the South, who is so good she knows how you can get home, but sends you fannying down a yellow brick road) and The Wicked Witch of the West (fly my pretties, fly); my other sister ran around being every other character, from the Scarecrow to all of the munchkins to a tree. The only thing I would ever be was Dorothy, with my faithful stuffed toy dog as Toto. That was all I wanted to be. Needless to say, I'm familiar with Judy Garland. The fluctuations in her voice, the smoothness of it in song, and the way she moved her hands. I could never do it all myself off course, but you know who can? Lisa Maxwell. During Tuesday night's performance, I would sometimes close my eyes so I could pretend it really was Judy Garland on stage. Not only did Lisa Maxwell move like her, talk like her, sound like her, she embodied the charm and anxiety that was Judy Garland at 46. She never over milked it, and more impressively she never came out of character. The accent, the moves, the flutters and ticks were all Judy from start to finish. None of that awkwardness where a British actor plays an American and struggles to hold onto the accent (cough! Sam Attwater who was brilliant in every other way... cough! ), which I've seen all too frequently. 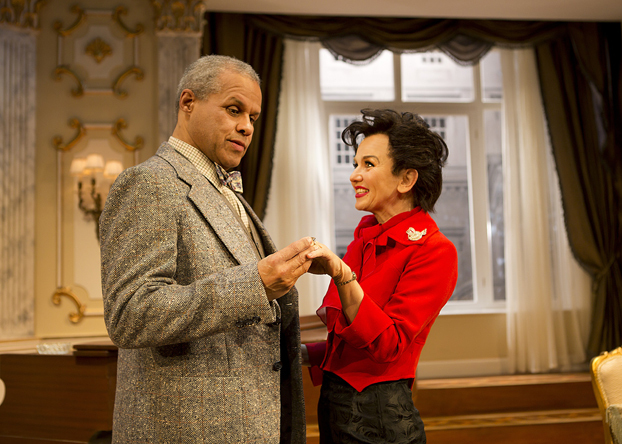 How can I end without talking about the tender, and gently humourous performance given by Gary Wilmot as Anthony Chapman, a pianist who accompanied Judy Garland in her shows. 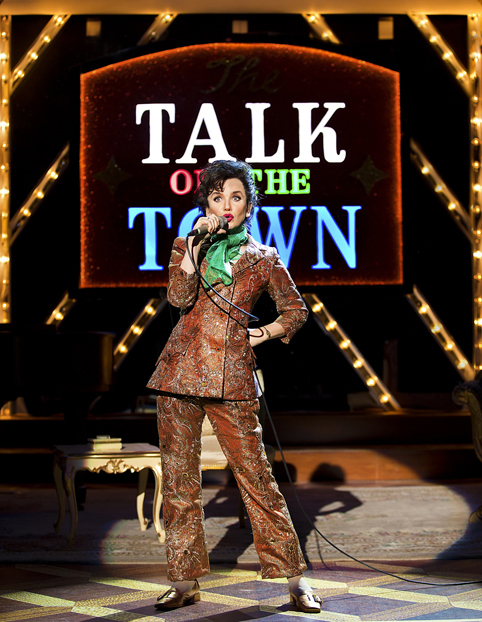 Wilmot plays Chapman as a man truly fond of Judy Garland, whether she be Garland or Gumm. Whereas Attwater's portrayal of Mickey Deans is intentionally conflicted. Does he really love Judy Garland? Or, does he love the fame and the name? I don't think we're meant to know the answer, and rightfully so, Attwater keeps us guessing. End of the Rainbow is on tour until July, and in Coventry until February 27th. That's right, this Saturday. Don't fret! You can find out where else it's playing, and book on their website. Judy Garland fan or not, you're going to want to see it.